PENSACOLA, Fla. - The Jacksonville Jumbo Shrimp (4-6) fell to the Pensacola Blue Wahoos (7-3) by a 4-3 score in the fifth and final game of the five-game series at Blue Wahoos Stadium on Sunday afternoon. Pensacola relief pitcher Sean Poppen (1-0) earned the win with two scoreless innings of relief work with four strikeouts. Jacksonville right-handed starting pitcher Cody Poteet (1-1) took the loss, working five plus innings where he allowed four runs (all earned) on 10 hits with a walk and no strikeouts. John Silviano gave Jacksonville a 2-0 lead in the top of the first with a two-run homer bashed to left field. The blast was Jacksonville's first of the season, with the club being the last Southern League club to record a home run in 2019. Tanner English answered for the Blue Wahoos with a solo home run in the bottom of the first to cut Jacksonville's lead to 2-1. Justin Twine added an RBI single for the Jumbo Shrimp in the top of the fifth to grow the lead to 3-1. The first five Wahoos hitters to the plate in the bottom of the sixth collected base hits off Poteet. Brian Schales collected an RBI single, then Jimmy Kerrigan gave the Wahoos a 4-3 lead with a two-run double, which would be the final. Magneuris Sierra extended his hitting streak to a club-best eight games by going 2-for-5. 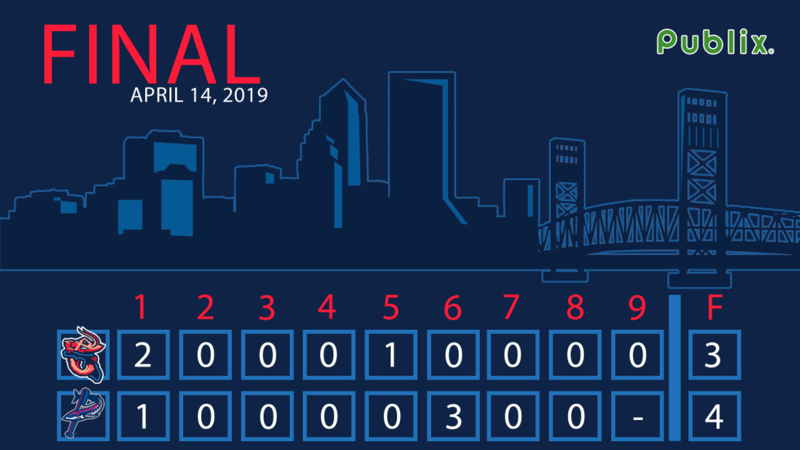 Parker Bugg worked a scoreless two innings out of Jacksonville's bullpen with three strikeouts, and left-hander Jeff Kinley turned in a scoreless eighth. The Jumbo Shrimp will bus home to Jacksonville tonight, then will begin a five-game series tomorrow night with Birmingham Barons at the Baseball Grounds of Jacksonville at 7:05 p.m. Right-handed pitcher Dustin Beggs (0-0, 4.91 ERA) will start for Jacksonville against Birmingham left--handed pitcher Kodi Medeiros (0-0, 0.00 ERA). Fans can listen to the game on the Jumbo Shrimp Network presented by Community First, beginning at 6:50 p.m. with the pregame show "Shrimp On Deck" locally on Sunny 102.3 FM, on the TuneIn Radio app, and www.jaxshrimp.com.